Late July brings quite a glut of herbs to harvest, including many of the more sun loving plants that make superb infused oils. In this particular case, a warm July morning saw me out rummaging in the garden, gathering in handfuls of the sunny yellow flowers of St John’s Wort, with its characteristic pollen that stained my fingers red after a short while. I already have a jar of infused oil on the sunny windowsill in the front porch, slowly starting to take on the distinctive red tinge of a good John’s Wort oil, and the handfuls that got gathered this morning will simply speed the process. I have a particular soft spot for St John’s Wort, not just because the seemingly alchemical process that turns a combination of pale yellow oil and bright yellow flowers into a deep garnet coloured potion utterly enchants me. St John’s Wort oil topically is fantastically useful and a vital addition to my dispensary. I’ve used it for all kinds of nerve pains and neuralgias, tense muscles, sore joints, any kind of inflammation and also, most dramatically, for shingles pain (where the plant’s anti viral properties also play a key role) and pain from any kind of nerve damage. It makes a gorgeous salve, with the addition of some beeswax (I tend to say about 12g of beeswax to 100mls of oil works quite nicely and makes a fairly soft salve) and provided you don’t allow water to get into the oil, it keeps for a good long time, though I haven’t managed to find the outer limits of its keeping time yet as it always gets used up! 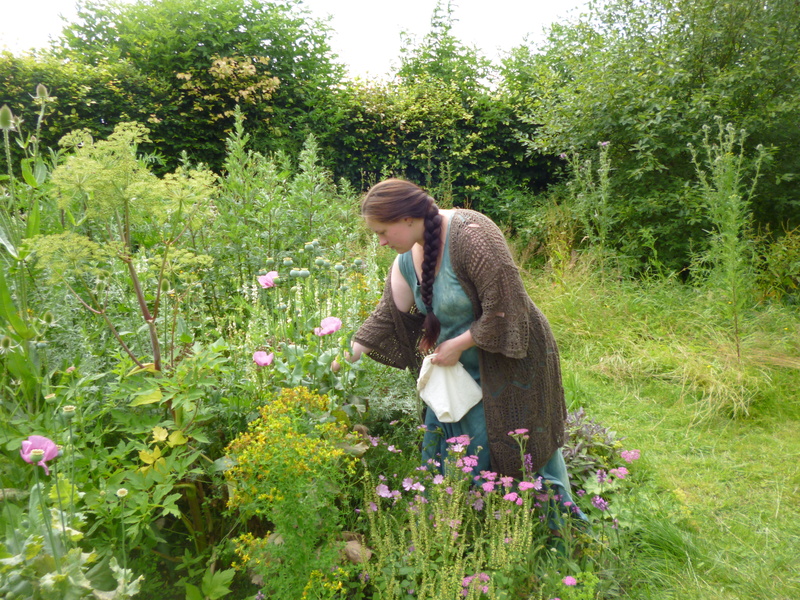 Picking St John’s Wort flowers in the main herb garden. St John’s Wort self seeds readily, so I have clusters of this cheery plant dotted all round the garden as well as several tubs in sunny corners. Good for me as it means lots of plant medicine! St John’s Wort sun infused oil is very easy to make, and it is one of the few oils that I do prefer to make using the sun infusing method, partly because the plant itself is so cheery and warming in both flavour and look, and partly because the plant has a long affiliation with the sun and Solar deities in general. Sun infusing the flowers feels like part of an ancient ritual that has been used for many hundreds of years! All you need is a decent sized jar with a rubber sealed top – Kilner or something like that works well. The one I used was a cheap second hand one found in a charity shop! A wide necked jar works better and makes for less spillage of flowers. Pick the flowers on a warm, sunny day (I was lucky I got mine in this morning as it is raining as I type this!) If you give the stems a good shake first, you’ll knock off a load of the little black bugs that smother any bright coloured flowers at this time of year. Pinch each flower firmly between thumb and forefinger, around the stamen of the flower, then give a quick tug. If you pick this way, you’ll leave behind many more of the unopened flower buds for next time! Pack the dry flowers into the jar and pour over any organic vegetable seed oil. I’ve used organic rapeseed for this lot, which I find works fairly well – its lighter than olive oil and absorbs more easily, but is still cheap enough that a spoiled batch isn’t a huge loss. 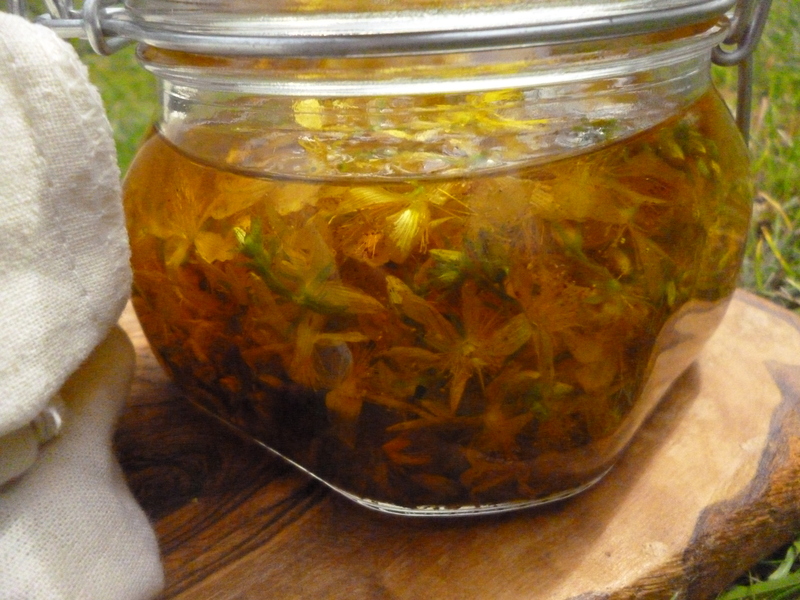 Seal the top of your jar, shake it up so the oil covers the flowers, then put it on a sunny windowsill. This infused oil has been steeping for about four days. I’ve just added a load more flowers, which should start making the colour of it darken down towards garnet instead of lightly colouring it. I estimate maybe two days of full on sunshine to do the job, longer if the month carries on being as rainy as it has been! Bear in mind that the more flowers you add, the darker garnet the final colour and the stronger the overall oil will be – so keep popping out and checking those plants! St John’s Wort flowers plentifully throughout July and the larger part of August, so with the load in my garden I should get at least three of these jars full of oil and flowers before the season finishes. The last few flowers and seeds will be cut with the rest of the green plant matter to make a tincture filled with the richness of summer sunshine. More on this in a later blog post, though! Happy picking! Plenty more unopened buds on this beauty! Oh Ali you are so inspiring and so full of knowing! It’s such a pleasure to see your skills at work. 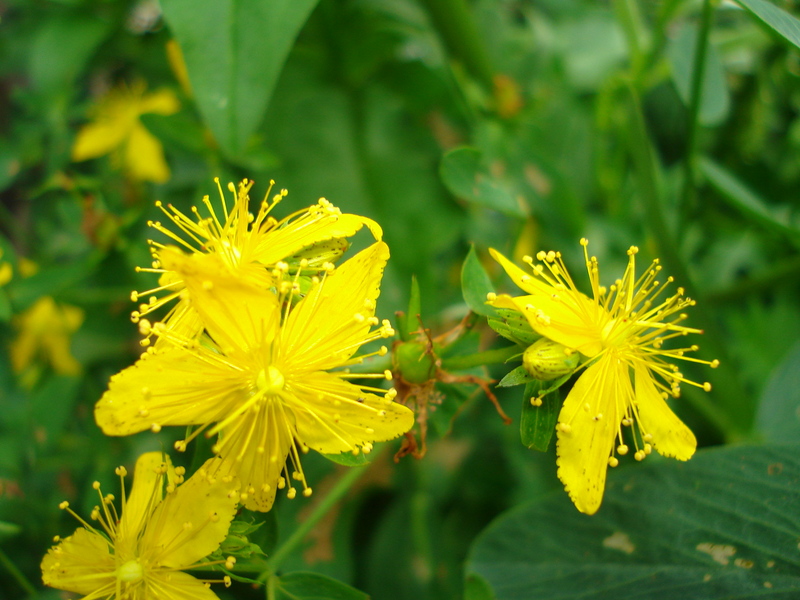 I used to take St John’s Wort a lot for depression many years ago and found it so helpful. I didn’t know how much more it can be used for; and that colour change is magical! 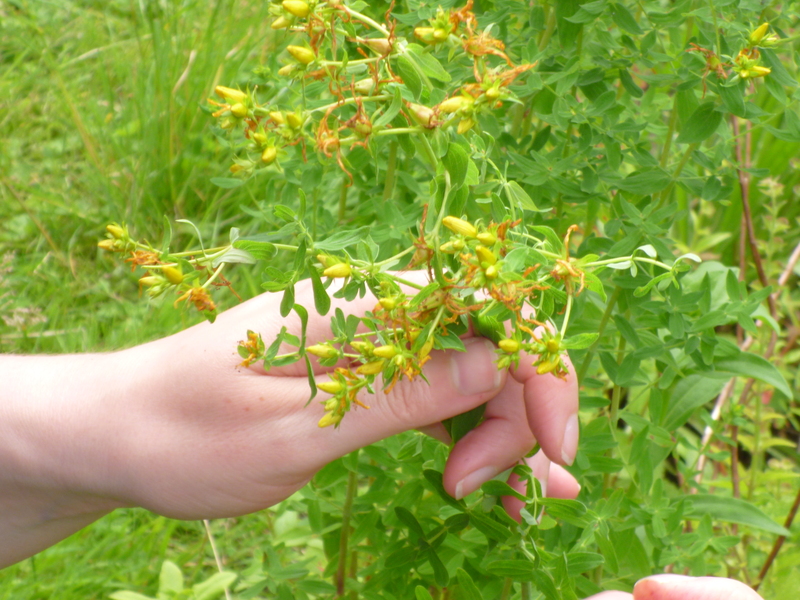 I will hunt out St. John’s Wort to plant in my back garden….